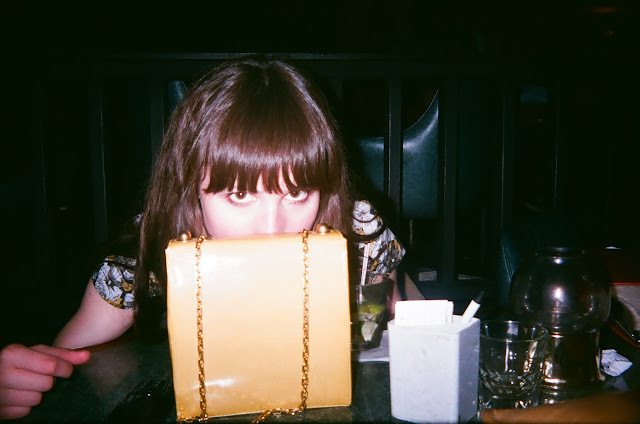 I bought this yellow purse at the Vintage Fashion Expo and it's already been broken in thanks to a sloshy evening at my favorite karaoke bar. At least it's made of patent leather... makes for easy clean-up of spilled gin gimlets! Ha! Patent leather is always handy for mopping away evidence of the night before huh, hehe. What a cute purse! I love the color. I always admire girls who can carry a small purse. How do you fit anything in there? I always overpack!